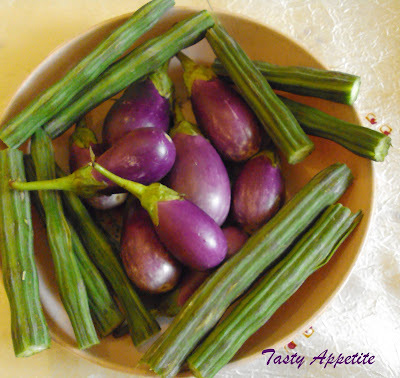 Brinjal Drumstick fry is a lipsmacking Indian food served with rice. This is super simple yet yummy recipe. In this recipe, the chopped drumstick and brinjal are cooked with masalas and deep fried. 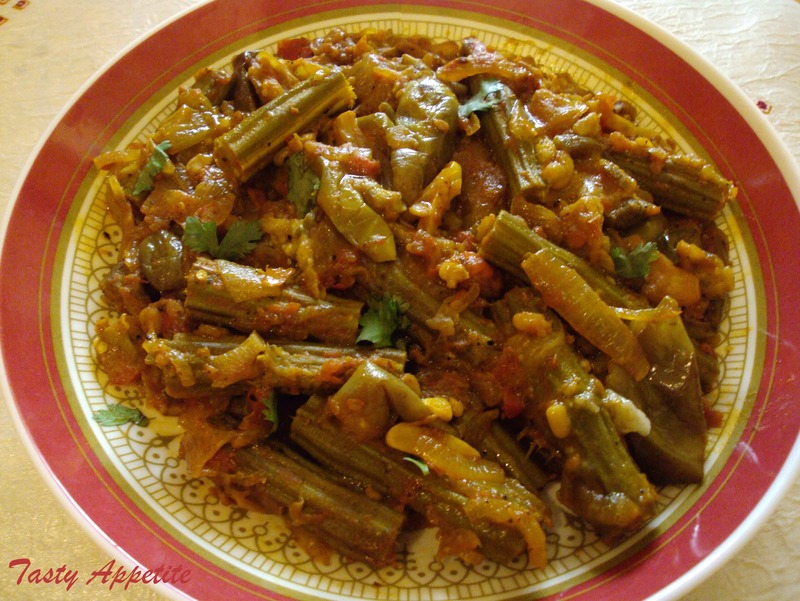 I love to have this very tasty vegetarian fry with morkuzhambu rice. So, here is my favorite recipe preparation…! 1. Chop drumstick to 3 inch pieces. 3. Heat a fry pan. 4. Add oil. Temper with mustard, cumin, curry leaves and split urad dal. 5. Add onion and fry till transculent. 6. Add chopped tomato and cook well. 7. Now add turmeric pwd and salt. 8. Drop drumstick in the masala, stir for a minute. 9. Add ½ cup water of water and cook covered. 10. It needs to be just done. 11. 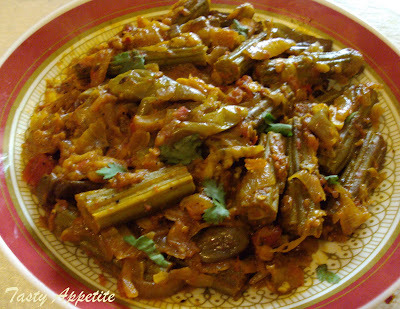 Now add chopped brinjal slices. 12. Add red chilly pwd, thick tamarind pulp and coriander pwd. 13. Stir for a while. 14. Close the lid and cook until they are done and the flavors mixed well. 15. Open the lid, so that the curry turns slightly dry. 16. Finally drizzle a tsp of oil to the sides, mix well and remove from flame. 17. Traditional yummy fry ready to enjoy with ricedishes..! This is one amazing combo for all rice dishes. yummy. This looks very delicious! Yummmy!! Looks yum and that's a delicious combo .. I used to make this too adding potatoes as well ... super comforting.. This looks yummy and it tastes good with chapathi. Congrats for the awards and for those who got it. Congrats on your awards dear :) you deserve them. Great combo. Looks great. Cograts on your award. Looks great. Congrats on your award you deserve it. 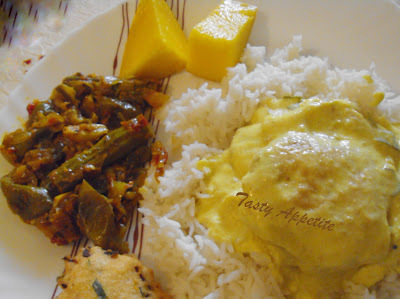 Ultimate combo, i can have this curry with a bowl of rice..yumm! What a combo! Looks delicious. Congrats on the awards! Thanks for the award, also love the two combination...sounds interesting curry..
Great combo. Looks great. Congrats on your award. I love this finger licking comfort food, delicious. Your drumstick fry looks delicious. I love drumstick, usually have them in veggie or chicken curry, have not tried them fried before. Thanks for sharing! hi jay, those are my favorite spices. at first i thought drumstick refers to chicken thighs as we call it here. But its not true, after seeing your photo and then you mentioned its a vegetarian dish.. photos help a lot in international recipes huh :) . anyway we do have the drumstick tree and like to eat them very much, but we only know how to cook them in curry dishes. must try yours also. Congrats to those who similarly receive these awards from you. 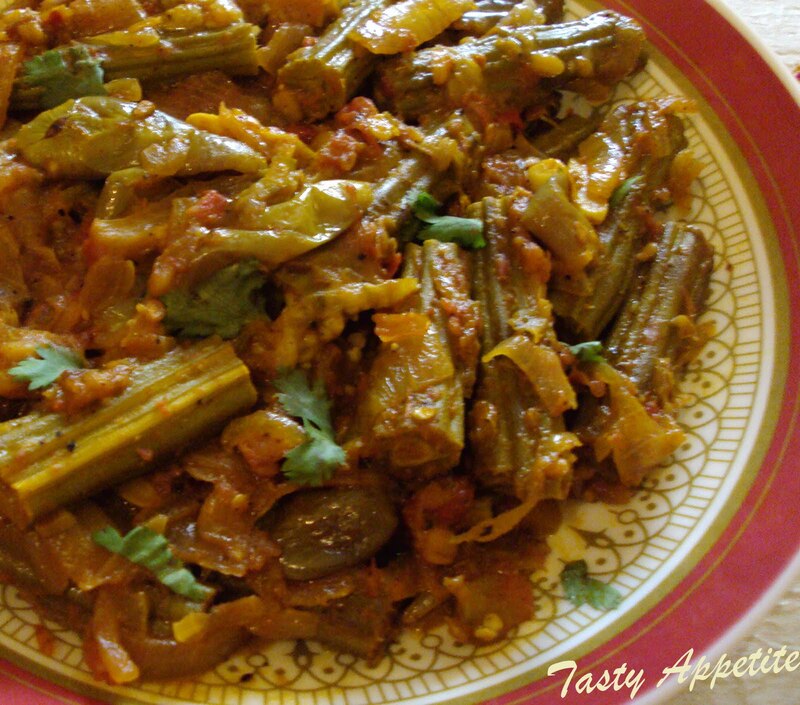 one of my most fav side dish fry..U r a true homey and makes awesome dishes..
Yummy combination.Sounds so very tempting. this looks really nice, it's so difficult to get the drumstick here, but if I do, I'll try your dish..bookmarked! Yummy combo! Congrats for the award ... you deserve it! Thanks for sharing with us.